Son of a teacher; brother of Saint Christian O'Morgair of Clogher. Upon the death of his parents, Malachy entered religious life. Ordained at age 25. Studied under Saint Malchus. Preacher and clerical reformer. Instituted celibacy regulations and other disciplines on the Irish clergy. Re-introduced the use of canonical hour prayers. Abbot at Bangor. Bishop of Connor, Ireland at age 30. Archbishop of Armagh, Ireland at age 35, the chosen successor of Saint Celsus of Armagh. Spiritual teacher of Blessed Christian O'Conarchy. Malachy replaced the Celtic liturgy (the "Stowe" missal) with the Roman liturgy in an effort to bring uniformity and discipline to the clergy and those in religious life. A miracle worker and healer, he sometimes cured people instantly by laying his hands upon them. 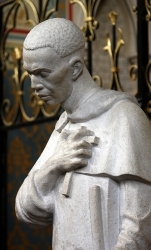 Friend of Saint Bernard of Clairvaux who helped him establish the Cistercians in Ireland, wrote a biography of him, and sat with him as he died. One of Malachy's great claims to popular fame was his gift of prophesy. While in Rome, Italy in 1139, Malachy received a vision showing him all the Popes from his day to the end of time. He wrote poetic descriptions of each of the pontiffs, presented the manuscript to Pope Innocent II - and it was reportedly forgotten until 1590. It has been in print - and hotly debated, both for authenticity and correctness - ever since. According to these prophecies, there is only one Popes remaining after Benedict XVI. It is most likely a 16th century forgery, but see the quotes below, and have a look at Father Dwight Longnecker's column on the prophecies. The words of the 108th prophesy are "Flos Florum" (Flower of Flowers). The 108th pope after Innocent II was Paul VI (1963-78). His coat of arms included three fleurs-de-lis (iris blossoms). The 109th is "De Medietate Lunae" (Of the Half Moon). The corresponding pope was John Paul I (1978-78), who was born in the diocese of Belluno (beautiful moon) and was baptized Albino Luciani (white light). He became pope on August 26, 1978, when the moon appeared exactly half full. It was in its waning phase. He died the following month, soon after an eclipse of the moon. The 110th is "De Labore Solis" (Of the Solar Eclipse, or, From the Toil of the Sun). The corresponding pope was John Paul II (1978 to 2005). John Paul II was born on May 8, 1920 during an eclipse of the sun. Like the sun, he came out of the East (Poland). Like the sun, he visited countries all around the globe while doing his work (he is the most-traveled pope in history). The 111th prophesy is "Gloria Olivae" (The Glory of the Olive). The Order of Saint Benedict had claimed that this pope will come from their ranks; Saint Benedict himself prophesied that before the end of the world his Order, known also as the Olivetans, will triumphantly lead the Catholic Church in its fight against evil. The corresponding pope to this description is Benedict XVI. The 112th prophesy says: "In the final persecution of the Holy Roman Church there will reign Petrus Romanus (Peter the Roman), who will feed his flock amid many tribulations; after which the seven-hilled city will be destroyed and the dreadful Judge will judge the people. The End." The illegitimate son of a Spanish nobleman, Juan, and a young freed black slave, Anna Velasquez, Martin grew up in poverty. He spent part of his youth with a surgeon-barber from whom he learned some medicine and care of the sick. At age 11 he became a servant in the Holy Rosary Dominican priory in Lima, Peru. Promoted to almoner, he begged more than $2,000 a week from the rich to support the poor and sick of Lima. Placed in charge of the Dominican's infirmary; known for his tender care of the sick and for his spectacular cures. 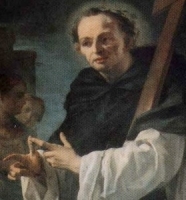 His superiors dropped the stipulation that "no black person may be received to the holy habit or profession of our Order" and Martin took vows as a Dominican brother in 1603. Established an orphanage and children's hospital for the poor children of the slums. Set up a shelter for the stray cats and dogs and nursed them back to health. Lived in self-imposed austerity, never ate meat, fasted continuously, and spent much time in prayer and meditation with a great devotion to the Holy Eucharist. Friend of Saint John de Massias. It made him very unhappy to see foundlings and young orphans exposed to all sorts of hardships. In order to obviate this sad circumstance he had built a celebrated college at Lima, where they could be brought up in piety and taught to lead honest lives. His goodness was so great that he did not except animals from his kindness, and he often gave them his skillful help and care. It pleased God to honour by His celestial favours the noble charity of His servant. Hubert was passionately devoted to hunting. While chasing a stag on a Good Friday morning, he received a vision of a crucifix between the animal's antlers. A voice warned him, "Hubert, unless you turn to the Lord, and lead a holy life, you shall quickly go down to hell." It was a conversion experience for Hubert. Spiritual student of Saint Lambert of Maastricht. When his wife died, Hubert renounced all his worldy positions, titles and wealth, handed his patrimony, and the care of his son, to his brother, and studied for the priesthood. After ordination, he served as assistant to Saint Lambert. Pilgrim to Rome, where he was when Lambert was murdered. Chosen bishop of Maastricht. Known for his excellent preaching and his generosity to the poor, stripping the diocese of all excesses to help them. Following another vision, and to defend of the memory of Lambert, he moved his mentor's body from Maastricht to Liege, and built a church for it on the site of Lambert's martyrdom. First bishop of Liege. Hubert predicted the date of his own death, and died while reciting the Our Father. He became highly revered in the Middle Ages, and there were several military orders named in his honor. His association with the hunt led to his patronage of furriers and trappers, and against rabies and bad behavior in dogs, primarily hunting dogs. The breed commonly known as bloodhounds are also called Saint Hubert's hounds. A swineherd in his youth, and a lazy one at that. Professional soldier in the Byzantine army for 20 years, and a dissolute one at that. Fought in wars against the Bulgars. A friend who had become a monk led him to the faith. At age 40, Joannicus retired from the military and the world, becoming a hermit on Mount Olympus, Bithynia (modern Uludag, Turkey). He developed a reputation for holiness, and had to move several times to escape would-be spiritual students. Monk at Eraste. A one-time supporter of iconoclasm, he fought it and defended orthodox teachings in the iconoclast movement of 818. He tried to be a peacemaker, arguing that the orthodox should try to understand and reunite with iconoclast priests. Advisor to Saint Theodore the Studite and Saint Methodius of Constantinople. Prophet and miracle worker. His prophesied the restoration of images to churches, a prophesy fulfilled by Theodora, wife of emporer Theophilus. Friend of Saint Peter of Atroa; at the time of Saint Peter's death, he had a vision of Peter being lifted up a mountain into heaven. Highly venerated by the Greeks. 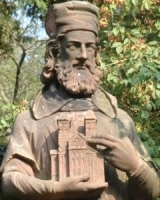 Son of the Christian queen Saint Cyneburga (Cuneburga), and the pagan King Alchfrid (Aldfrith) of Northumbria. Grandson of Penda, king of Mercia. He lived only three days during which time he repeated several times "I am a Christian", and asked for Baptism (which he received from bishop Wilderin) and Holy Communion. Immediately after Baptism, he made a confession of faith the Holy Trinity, preached a sermon on the Trinity, reciting Scripture and the Athanasian Creed as part of his proofs. He completed this performance by predicting his death, and outlining his desired burial arrangements. A statue of Rumwold at Boxley Abbey could supposedly only be moved by people who lived pure lives. Purity was apparently measured by the size of a donor's gift to the abbey since if it was sufficient, one of the monks would operate a ratchet mechanism that helped move the statue. This was exposed and the statue burned during the Reformation. One Sir Alured was chastised by the saint for swearing on his wedding day in 1282. Alured repented and cleaned up his language. However, at a royal feast some ice cream made his tooth ache, which caused him to curse with gusto. Romwold suddenly appeared in a window, and Sir Alured's bride disappeared in a puff of perfume, leaving behind her clothes. There are churches dedicated to him in Kent, Essex, Northants, Lincolnshire, Dorset, and North Yorkshire in England. Born to the nobility, the son of Count Ballachi. His family had a close association with the Church clergy; two of his uncles became archbishops of Rimini, Italy, and a younger brother was a priest. Trained as a soldier and in administration, he was expected to take over the family estates. Against his family wishes, he joined the Dominicans as a lay-brother at age 27. Assigned to work in the garden of his friary, something he knew nothing about but which he loved instantly. He saw God in everything, and prayed constantly as he worked. 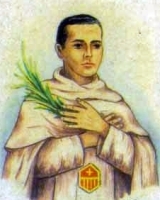 Noted for his simple life, his strict adherence to the Dominican Rule, and his excellent work as a catechist to children. A visionary, Simon was visited by the devil, by Saint Catherine of Alexandria, Saint Dominic de Guzman, Saint Peter Martyr, and the Blessed Virgin Mary; other brothers saw his cell glowing, and heard angelic voices. Blinded at age 57, he was nearly helpless during the last years of his life; he never despaired, and used the extra free time for prayer. Born to a poor peasant family. Bed-ridden with leprosy while still very young; in later life she first lost the use of her arms and legs, then lost the limbs themselves. Became known for holiness and penance. Had the gift of inedia, subsisting solely on Holy Communion. A church was built next door to her hovel with a special window between the structures so she could attend Mass. Counselor to Queen Adela of France. Legend says that near the time of her death, she was cured of her disease by the intervention of Our Lady. Fith of nine children. Studied in seminaries in Nozeroy and Vaux-sur-Poligny, France. Member of the Paris Foreign Missions Society. Ordained in 1848. Missionary to Vietnam. Director of the Society's seminary. Taught philosophy and translated textbooks for his students. Noted for having a deep spiritual life in the midst of endless work. In the persecutions of emperor Tu-Duc he had to go on the road, hiding from imperial anti-Christian forces, but was eventually betrayed to the authorities, imprisoned in a cage for three months, starved for three weeks, tortured and martyred. Born to the Italian nobilty, the son of Count Berardo and Countess Theodosia of Carsoli, Italy; great-uncle of Saint Rosalia. At age seven he was sent to study with the canons of the cathedral of Santa Sabina dei Marsi. Studied at Monte Cassino Abbey from 1095 through 1102. Chosen as governor of the Campagna province of Italy by Pope Paschal II. Created cardinal in 1099 by Paschal II. Bishop of Marsi, Italy in 1109 where he served the rest of his life. A reformer in his diocese, he fought simony and insisted on clerical celibacy. Possibly of Visigoth ancestry. Monk, following a mixed rule with strong influences from Irish monasticism. When the Saracens invaded Spain, he fled to the Rhineland (in modern Germany) where established or restored several abbeys. He rebuilt Dissentis Abbey after its destruction. Founded and served as abbot of Mittelzell Abbey on Reichenau Island, Germany. Exiled for political reasons to Alsace where he founded monasteries at Amorbach, Gengenbach, Hornbach, Marmoutier, Murbach, Neuweiler, and Wissembourg, and may have worked with Saint Amor of Amorbach. Appointed as a regional bishop, but without specific see city. 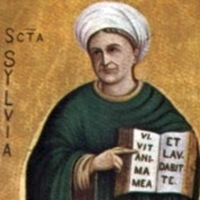 Probable author of Dicta Pirmini, a popular work on theology and ethics. One of the great Apostles to the German lands. Son of a Breton chieftain. Educated at Landevennec, Brittany (in modern France under Saint Winwaloe in 489. Monk at Landevennec. Abbot of Landevennec in 532. Missionary to Britain and Ireland where he abolished the last pagan customs. Helped establish Cornouailles in Brittany in 546. Sixth century king, part of the Brychan family who ruled Ewyas (modern Hereford and Monmoth), England. A nobleman's daughter fell in love with Clydog, but a friend who wanted the girl himself murdered Clydog near the River Monnow in the Black Mountains. His body was placed on an ox-cart and driven for home. En route, the ox stopped, the yoke broke, and the ox refused to be driven further. So, in order that Clydog could have a proper burial, a church was built on the spot, now known as Clodock, and he was interred in the hallowed ground around it. Miracles reported at his tomb. Due to a translation error, some older lists describe him as a martyr - the word Merthir means shrine, and refers to the church, but it was misinterpreted as martyr by some writers. Benedictine monk at Engelberg, Switzerland. Spiritual student of Blessed Frowin, and succeeded him as abbot at Engelberg on 27 March 1178. Noted for his encouragement of scholarship, piety and monastic discipline among his brothers, and for his own study of the Bible and the early Church Fathers. Known as a miracle worker, he foretold the death of Emperor Frederick Barbarossa. When he blessed a lake near Stanzstad, Switzerland, it became stocked with fish. He is recorded to have changed water into wine three times. At age 12, Lorenzo left school to help support his widowed mother. Worked at a railway station. Joined the Mercedarians in Lorca, Spain, making his profession on 23 September 1920. Ordained on 18 December 1926. Dean of students at the College of El Puig. Teacher for five years at a boy's home in Godella. Martyred in the Spanish Civil War. Countess, married to Count Henry of Toggenburg, Switzerland. Henry was abusive, especially after time when the couple had no children. Ida finally left Henry, and he later agreed to her becoming a Benedictine nun at Fischingen Abbey. First bishop of Agrigento, Italy; one tradition says he was assigned to the post by Saint Peter the Apostle, but it is also likely he lived and served after Peter's death, perhaps as late as the 3rd century. Noted and successful preacher. Built a church on the site of the current cathedral of Agrigento. Martyr. His intercession was effectively sought in 1625 during a plague that afflicted Agrigento. Sister of Saint Tarsilla. Married to Gordianus, a Roman regionarius. Mother of two sons, one of which was Pope Saint Gregory the Great. After the death of her husband, Silvia devoted herself to religious life, living in a cell like an early anchoress. Noted for her great personal piety. Bishop of Urgell in the Spanish Pyrenees from 1010 till 1035. Built the cathedral in Urgell, and established a rule for its canons based on the life of Saint Augustine of Hippo. Often at odds with the nobility of Urgell both for political reasons and because he was a reformer. Emigrant of France. Evangelized in the area of Atrebati, France. Hermit at Arras, France under the direction Saint Vedast Abbey. • reported buried at Christ Church, Canterbury, England "in a chest on the beam beyond the altar of Saint Stephen"
Priest. 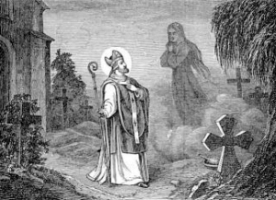 Worked with Saint Saturninus of Toulouse in France. Martyred in the persecutions of Diocletian. Monk in the Aragonese Pyrenees near Benasque. Spiritual student of Saint Victorian. Bishop of Tarazona, Zaragoza province c.565. Priest. Worked with and martyred with Saint Hilary of Viterbo in the persecutions of Diocletian. Fifth century hermit. Lived 60 years in a cave near Cyrohas, Syria. Ordained when a very old man, shortly before his death. Deacon. Worked with and martyred with Saint Valentine of Viterbo in the persecutions of Diocletian. Brother of Saint Sulian. Founded churches, including in Anglesey and Pembrokeshire in Wales. One of the first disciples of the Apostles. Mentioned in Saint Paul's letter to the Romans. Martyred in the persecutions of Decius. Bishop in the area of Tarves, Aberdeenshire, Scotland. Bishop of Vienne, France. He was zealous in ransoming captives. Hermit at a monastery in the Vosges region of France. Eleventh-century nun in Alem, Flanders (in modern Netherlands). Sixth century abbot of a monastery in northern Wales. A large group of Christians martyred in Zaragoza, Spain by Dacian during the persecutions of Diocletian. Dacian ordered all Christians of the city into exile under pain of death; when they were assembled to leave, Dacian ordered imperial soldiers to massacre the lot of them.